Islam is the world’s second largest religion. This religion, which began during the 7th century in Mecca, is practiced now by almost 25% of the world’s population. Through the ages and continents, the Muslims have built some beautiful mosques around the World. Places of prayer but also to meet and study, mosques follow strict rules in terms of architecture and decoration. Some elements – as minarets, domes and prayer halls – can be found in almost every mosque. However, Man has shown a lot of creativity and diversity when building these places. Below, you can see some of the most amazing mosques in the world. The largest and oldest mosque in the World – located in the holiest site in Islam – the Masjid Al Haram has been built during the 7th century. The annual pilgrimage to Mecca is one of the largest gatherings in the World, up to 2 million worshippers will pray here together. This beautiful mosque shelters on its center the Kaaba, the most sacred site of Islam. This building protects the Kaaba stone, a relic which, according to Muslim tradition, dates back to the time of Adam and Eve. Built near the place where the prophet Muhammad used to live and also holding the prophet’s grave, Al Nabawi mosque is the second holiest site in Islam, one of the biggest mosque in the World. In 1909, Al Nawabi mosque became the first place in the Arabian Peninsula to be provided with electrical lights. Built during the 7th century A.D, the dome of the rock mosque is a UNESCO World Heritage Site. Its architecture and mosaics were patterned after nearby Byzantine churches and palaces, which gave it a pretty unique architecture. The Dome covers a rock believed by some Muslims and scholars to be the spot from where Muhammed ascended to heaven. Others believe that place to be the Al Aqsa Mosque. In Jewish tradition, the rock is understood to be where Abraham prepared to sacrifice his son. Its official name is the Sultan Ahmed Mosque, but it is known more popularly as the Blue Mosque because of the blue tiles that decorate the inside walls. More than 20,000 blue tiles cover the walls. Built during the 17th century, this mosque was considered to be the starting point to the pilgrimage to Mecca. The most important mosque of the United Emirates of Arabia. This mosque was opened in 2007, after 12 years of construction. Today more than 40,000 worshippers can pray there at the same time. This beautiful mosque – the only one from UEA accessible to tourists – contains the largest mosque dome in the World (almost 33 meters of diameter). Opened in 1993, this mosque has many particularities: first of all, a part of it has been built on the sea; the mosque holds a museum and a library; and, finally, you can admire there the World’s highest minaret. At its top, 210m above sea level, a laser points across the sea towards Mecca. Also known as the Pink Mosque, this mosque was built in the lat 1870’s. Famous for its ceiling and its numerous colored glasses, this place offers an incredible atmosphere when the sunlight passes through the glasses. We recommend you to visit it during the morning, when the sun rises. Built in 1912, this is one of the grandest and oldest mosques in Malaysia. This mosque is enhanced with five large domes symbolizing the Five Pillars of Islam. Located in Spain, the buildings on this site are as complex as the extraordinarily rich history they illustrate. Historians believe that there was first a temple to the Roman god, Janus, on this site. The temple was converted into a church by invading Visigoths who seized Cordoba in 572. Next, the church was converted into a mosque and then completely rebuilt by the descendants of the exiled Umayyads, the first Islamic dynasty who had originally ruled from their capital Damascus (in present-day Syria) during the 7th century. Originally built during the 16th century, this mosque has been destroyed by Ivan the Terrible during the same century. In July 2005, the new building has been inaugurated. This Russian mosque – surprising due to its modern design – holds also a library and a museum. This beautiful mosque, located in Malaysia, has been inaugurated in 2008. It offers a unique experience to its pilgrims and visitors with its glass plates reflecting the sunlight. The interior design is a mix of Arabic and Chinese influences. An amazing architectural testimonial of the Tang emperor’s welcome to foreign cultures in their empire, the Great Mosque of Xi’an is also a mix of Arabic and Chinese influences. However, its exterior design, dominated by Chinese architectural elements, makes this mosque unique in the World. The World’s biggest building made in adobe (sun-dried bricks, made of straw and clay)! The Great Mosque of Djenné is, like the city, a UNESCO world heritage site. There has been a mosque on this site since the early 13th century, but once a year the entire community of Djenné throws an annual community event to prepare the Mosque for the upcoming rainy season. This list is, of course, far from being exhaustive! Don’t hesitate to give names of other beautiful mosques in the comments. 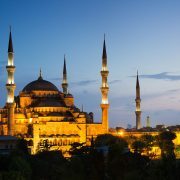 Share the post "The most beautiful mosques in the World"